Facts noticed: Most of this is off record and I'm honestly not even sure if that kind of a screenshot is good enough anymore but he has been teamkilling by "accident" a lot. Server started and he tried to teamkill me, then he reconnected and tried to lie his way out. Also teamkilled commander by shooting him in the head by "accident". Finally the last trick he pulled off was shoot terrorists following in a line. 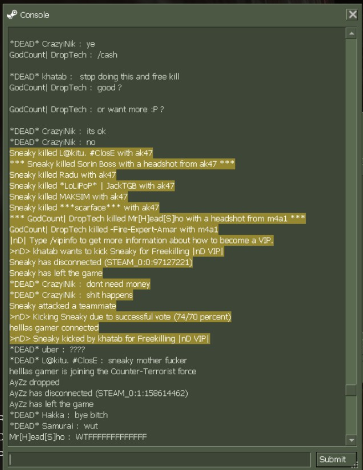 He was kicked by vip after the mass freekill and later on when he tried to reconnect back. more in chatlogs, that's just tip of the iceberg. Last report after these two as the answer I was given is that nD is happy to have these kind of people because the server is full thanks to them. So yeah I'll stop reporting them if quantity > quality. I will accept this report based on the reaction to the whole server and the fact that he left right after doing it. He was also banned by a member a few days ago for teamkilling.